Supporters of former President Barack Obama and Democratic gubernatorial candidate Ralph Northam during a rally in Richmond, Virginia, in October. The first major statewide elections since President Trump was inaugurated take place on Tuesday. The governor’s race in New Jersey looks like it will be a blowout. But Virginia’s governor’s race is more interesting: Former Republican National Committee Chairman and 2014 U.S. Senate candidate Ed Gillespie faces off against Democratic Lt. Gov. Ralph Northam. And while the race’s final result by itself isn’t likely to tell us much about the national political environment, it is likely to have a big effect on the 2018 midterms. Polls show a fairly close race, with Northam slightly favored to win. An average of the last 10 surveys give Northam a 46 percent-to-43 percent advantage. Over the past month, there has been a tightening of the race, with Gillespie closing what had been a 6-point lead. In the individual polls, though, there is a fairly widespread. Northam has led by as much as 17 percentage points (a Quinnipiac University survey) and has trailed by as much as 8 points (a Hampton University poll). So what accounts for the divergent results? As I’ve discussed previously, much of that spread can be explained by sampling error. In fact, it’s a good sign, suggesting that pollsters are working independently rather than cribbing off one another’s results. Some of the disagreement, though, may have to do with how hard pollsters are pushing undecided voters to choose between the candidates.1 Gillespie did best in the poll with the most undecided voters — that could be a sign that undecided voters will break away from him and towards Northam on Election Day. In an off-year election, though, perhaps the biggest question is turnout. Turnout tends to be lower in non-presidential elections and figuring out who will vote becomes crucial. Pollsters who are calling people based off lists of registered voters and mostly relying on their past turnout history (instead of calling random numbers and asking if a person is registered to vote and whether they are going to vote) have tended to get a tighter range of results in Virginia. 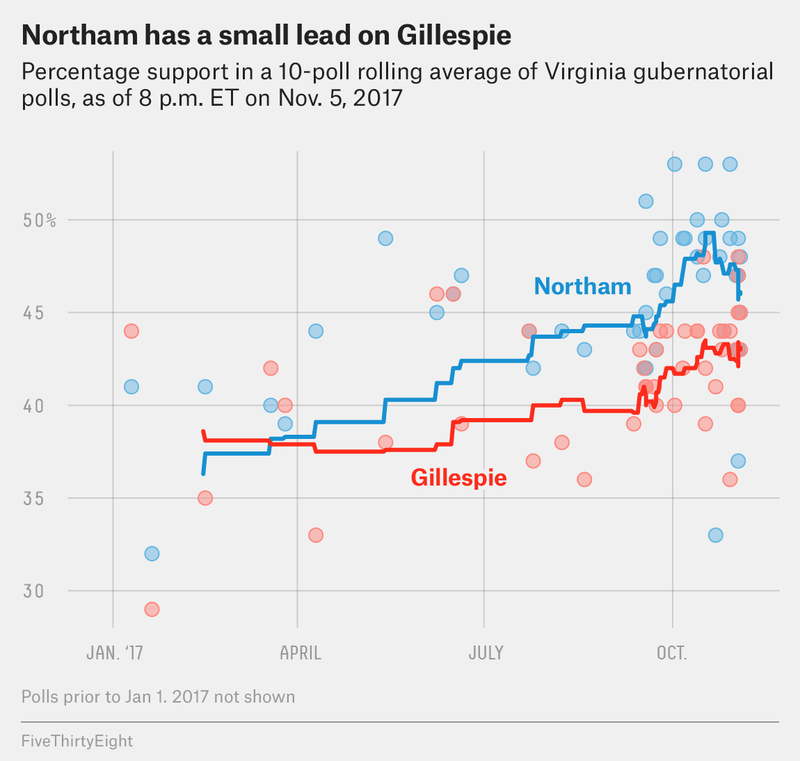 These polls mostly show a single-digit Northam advantage. The two biggest outliers (Hampton and Quinnipiac) did not use these lists. That might be why the Hampton poll showed Gillespie well ahead, with Republican respondents making up a larger share of likely voters compared to what most other pollsters found. Accordingly, a higher-than-expected Republican turnout could put Gillespie over the top. Whatever the result ends up being, we shouldn’t read too much into what it means outside of who gets to control the Virginia governor’s mansion for the next four years.2 Since 1993, Virginia governor elections have done a bad job of predicting the following year’s U.S. House results. The Virginia governor swing compares the state’s partisan lean in the previous two presidential elections to the governor’s election result. The partisan lean compares the state’s voting patterns to the nation’s. For each cycle, the prior presidential election is weighted 75 percent and the one before is weighted 25 percent. Democrats won the Virginia governorship in both 2001 and 2013, even though their party lost seats in the following House election. The amount by which either party outperforms the partisan lean of the state3 is no better an indicator of the following midterm outcome. Look at a bunch of gubernatorial races together and you’ll do better. (To understand the national political environment, it’s always better to look at an average of elections.) But it’s a mistake to focus too much on any one contest. That said, being predictive isn’t the same thing as being impactful. And Virginia could certainly be the latter. Republicans seem intent on looking to Tuesday’s results for clues about how to run in 2018. Specifically, they want to see how Gillespie’s message plays. Gillespie, an establishment Republican by pretty much any reasonable standard, has tried to mix the traditional Republican message of lower taxes with the Trump message of being tough on crime and immigration. He’s combining economic conservatism with cultural conservatism. In doing so, he hopes to appeal to normally Republican voters as well as the white working-class voters who were brought into the Republican tent by Trump’s message. If Gillespie wins, expect Republicans to copy his playbook in 2018. Gillespie pollster Gene Ulm believes Republicans will run on issues such as sanctuary cities if Gillespie wins. Even if he barely loses, Ulm still thinks Republicans will use Gillespie’s campaign as a guide. That’s because Virginia has different demographics than the rest of the country. Specifically, the state is more educated than the country as a whole. Therefore, Ulm argues that a small Gillespie loss on a cultural conservative message (that polls show may play poorly with well-educated voters) might become a win in many other states. On the other hand, Republicans might be hesitant to embrace the more racially freighted parts of Trump’s message if Northam wins easily. They may view a large Northam victory as a sign that Trump’s triumph was a one-off or that you need him as the messenger. Either way, Republicans might connect Gillespie’s defeat with Trump’s low approval ratings and see Trump as electoral poison in 2018. Democrats, for their own part, may look to Virginia to understand whether the party is turning out black voters. Black voter turnout declined in 2016 (much to Hillary Clinton’s detriment) and has stayed relatively low in special elections this year. If Northam loses, it may spark a conversation that the Democratic Party at large and Northam specifically did not do enough to energize black turnout. But 2018 is still a long ways away. Let’s talk about Tuesday night. To help you follow the returns, I’ve created a scrollable table of all 133 Virginia counties and independent cities. In the table, I have Gillespie’s benchmarks for each county and independent city based off the 2013 governor results, 2014 Senate results and 2016 presidential results.4 If Gillespie is consistently beating these benchmarks, he should be on track to win. If he’s consistently underperforming these benchmarks, the race will likely go to Northam. Overall, the numbers tell the story of a divided Virginia. Democrats usually do best in the very well-educated Washington suburbs, such as Arlington, and then in a line of counties and cities with large African-American communities, from Richmond to Hampton (including Newport News). Republicans do best in the lightly populated and mostly white cities and counties in the central and western parts of the state. While some places’ partisanship has stayed relatively steady compared to the state, others have differed vastly in the past few elections. In rural Alleghany County for example, Gillespie did slightly worse in 2014 than he did statewide. In 2016, on the other hand, Trump’s margin was about 42 percentage points better in Alleghany than statewide. Heavily populated Prince William County had the opposite trend. The margin was 2 percentage points more Democratic than the state in 2014, but it was 16 points more Democratic in 2016. Those differences at least partially reflect Trump doing better in rural areas and worse in urban areas than Republicans have historically done. One last thing to remember: The heavily Democratic Washington suburbs tend to report their results later than the rest of the state. So just because Gillespie has an early lead, it doesn’t mean he’s going to win. Trump led very late into the evening on Election Day 2016 before losing the state by 5 points. The polls suggest a similar fate awaits Gillespie in 2017, though we won’t know until the votes are actually counted. Granted, whoever wins will help to dictate the state’s redistricting process for the U.S. House after the 2020 census. See here for a fuller explanation of how we calculate that lean. These benchmarks were calculated by taking the result in each county and independent city and subtracting out the statewide result in a given election. For example, the 2016 benchmark for Arlington County is -54 points Republican because Trump lost it by 59 points and he lost statewide by 5 points.